Why is January the “Get Organized” month? What sparks this frenzy in almost every human on earth? Personally, for me, I think I have this urge to purge and organize in January because of all the holiday chaos from Halloween to New Years. There’s just so many holidays in a short period of time. Too many crafts, too much stuff purchased, too many gifts. By the time January rolls around I’m so glad the October-December marathon is finally o.v.e.r. that I can’t wait to just get rid of it all. Get rid of every last stitch of holiday decor. Get rid of old toys to make room for all the new ones that were received. And let’s face it… to get rid of all the people! Too many holidays and too much extended family. I need an extended-family-detox in January! So, um, ya, I’ve been on this purging frenzy lately for how to treat a herpes outbreak. I just need my life to feel calm and organized and not disheveled for another moment. 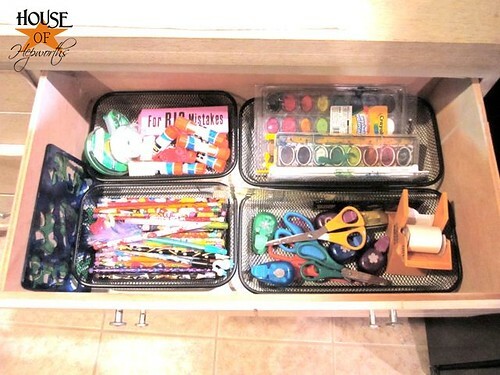 I already tackled my bathroom drawer last week, and this week I took over the M&M’s – the Medicine cabinet(s) & the Marker and craft drawers. First I started with the medicine. This probably looks like an “After” to most people, but for me, it was causing me rashes and hives. 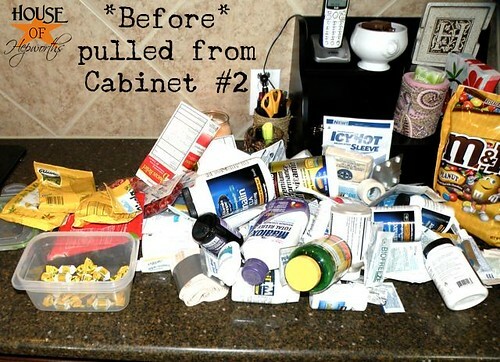 And I was so unorganized with it that I couldn’t even find my rash and hive cream! Cabinet #1 is my cabinet for all our doctor related stuff that we use daily, or frequently. The goal was to give this stuff one shelf TOTAL, but as you can see it crept into two shelves. Also, random stuff made it’s way in there. I don’t think I really need 150 Neil-Med sinus rinse packets TODAY. Maybe I can put like 140 of them somewhere else? And last time I checked, I never need TWO Neil-Med sinus rinse bottles at the same time. Ouch! And I’m counting at least 5 boxes of bandaids from this picture alone. I’m 99.9% sure no one in my family is a hemophiliac. 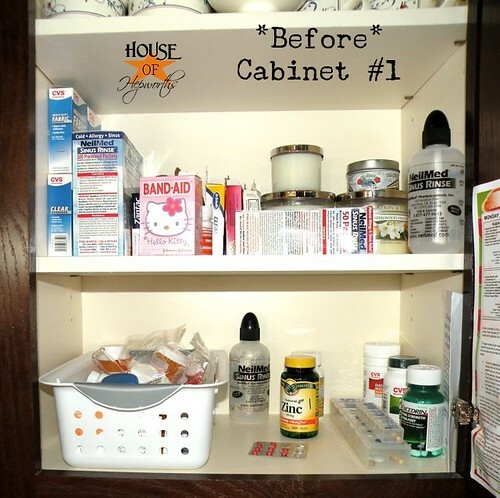 This is about 1/3 of all the crap I pulled out of the cabinet where we store the remainder of our medicine stuff. Minus the M&M’s. Those are for my gumball machine. 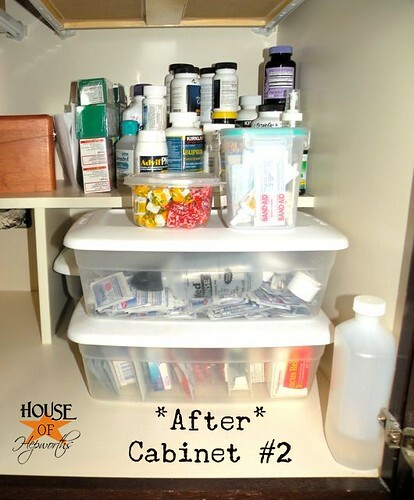 So after I went through and tossed all the expired stuff (more medicine than I’d like to admit) and then threw away at least 15 little plastic medicine cups for the kids liquid medicine as well as about 4 medicine syringes, and then another 10 or so tubes of various creams for a variety of body parts… I was left with an organized Cabinet #2. So now for the 2nd “M” to my M&M post – Markers and craft crap. 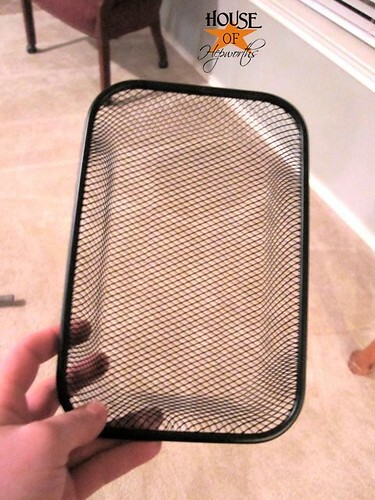 I was at the Dollar Tree and found a stack of the BEST metal baskets! And for, you guessed it, A DOLLAR! These things are solid. They are not flimsy crap I’d expect from a dollar store. They are actually really heavy and nice. So I bought like 15 of them. They came in 3 different sizes. I think they came in silver too. But I like my stuff to all match, so I bought them all in black. The chest I bought for my kitchen (that is still sadly unpainted) has become the kids homework and craft dumping ground. I was hoping to keep placemats and linens in the chest, but quickly realized it was better served as a craft catchall. My kids LOVE with a capital L crafts and artwork. Love it. So they’ve got lots of supplies. 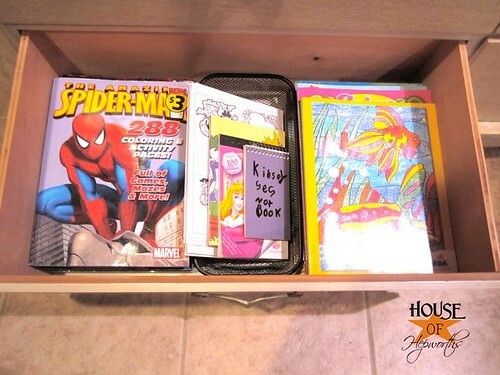 The 6th and final drawer has placemats and linens. I love these little baskets from Dollar Tree! 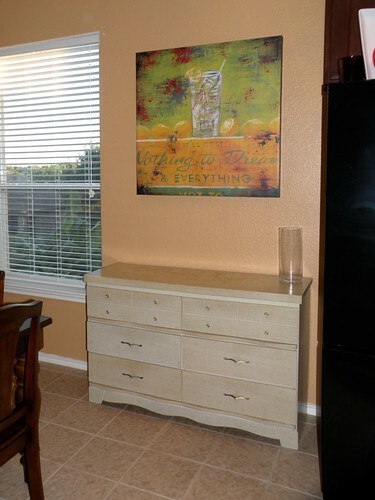 I used the rest of them to organize my entry way table, but I didn’t take pics of that and I’m too lazy to do it now. Plus, it’s really nothing to see. 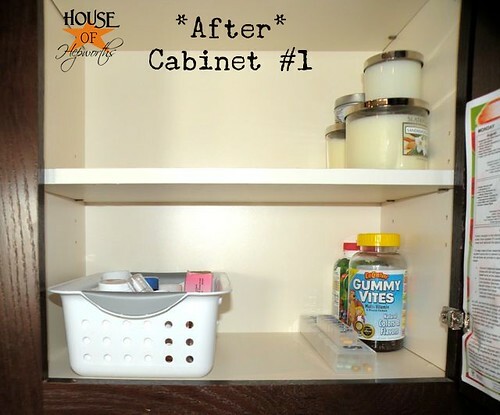 Two organizers inside each drawer to hold our candy stash. Nom nom nom. I’m now one step closer to feeling like I have a calm organized life. All I need now is for the laundry to wash, fold, and put itself away and the dishes to do the same and I’ll be good to go. Considering this is Organization Month, I’m sure you all have been busy with your own projects. Do share! I’d love to read all about them. Also, if you have links to posts you’ve written, share them with us. 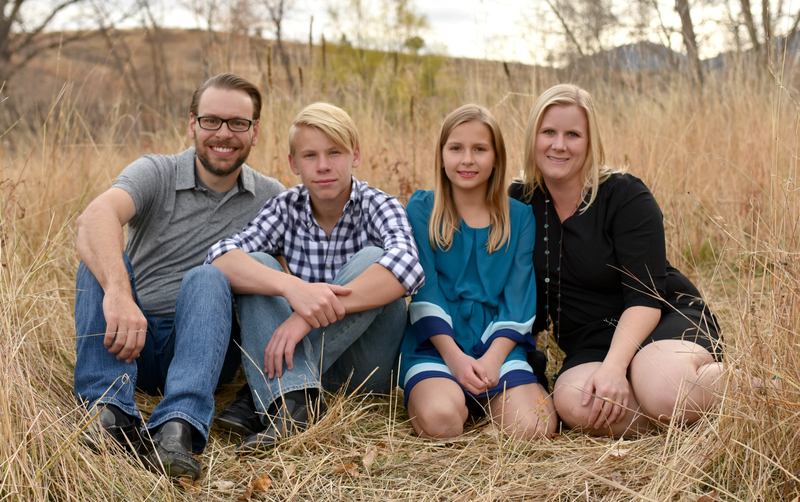 My other readers and I want to see them! Oooooh, love those baskets! Dollar Tree, seriously? 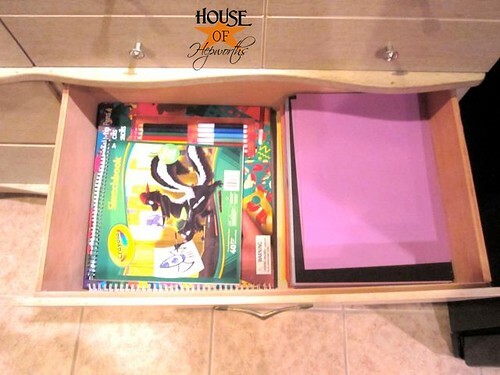 I love being organized, it helps me feel like there is at least a little sanity in my life! great job! January -month of organizing? I’m calling 2011 the YEAR of organizing. After living in the same house for 35 years, stuff happens! I’m in the process of clearing it out-one closet, cupboard, shelf at a time! I’m glad that blog land holds me accountable. Did you just get those baskets? I just bought the silver ones at Dollar Tree yesterday. They didn’t have enough black for me. I should have bought more. I used up 9 in my kitchen drawer and I wanted to put some in my bathroom. But they are very sturdy and so much nicer than plastic. Awesome! Love those wire baskets! May have to swing by the dollar store tonight! See if they still have them! I haven’t seen these baskets at the Dollar Tree. 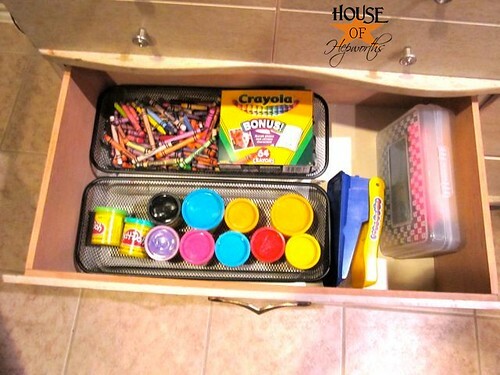 Dontcha just love organizing?! I have those baskets too love them! 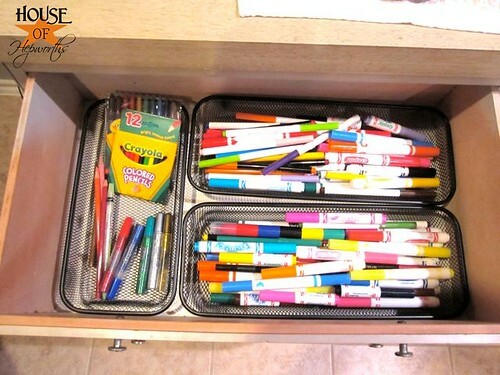 I now love organizing! I would love for you to come by and see all the fun stuff to organize! How come I can never find such great containers at our nearby dollar stores, lol?